Japan’s Sumire Suto and Francis Boudreau-Audet perform their short program at the 2016 World Figure Skating Championships. In the spring of 2015, Japan’s Sumire Suto and Francis Boudreau-Audet from Canada teamed up to represent Japan in the pairs discipline. The new team achieved some decent results this past season, starting with a seventh place finish at the Golden Spin Zagreb. The team then secured the Japanese national title in December, won the Mentor Nestle Nesquik Torun Cup in January, and finished ninth at the Four Continents Championships in February. At the end March, the Japanese champions competed at their first World Championships in Boston, Mass. With Suto’s knee injured from a fall during a practice session, the pair could not pull off their best performance and placed 22nd in the short program, and as a result, did not qualify for the free skate. In retrospect of their first season skating together, as well as the first season competing on the senior circuit, the students of Richard Gauthier and Bruno Marcotte believe they are on the right track. In order to be competitive on the international stage, the pair listed some specific areas they are working on, the first of which is more difficult elements. “We are now working on putting the triple twist into our programs,” Suto revealed, adding that they wanted to improve all of their elements. 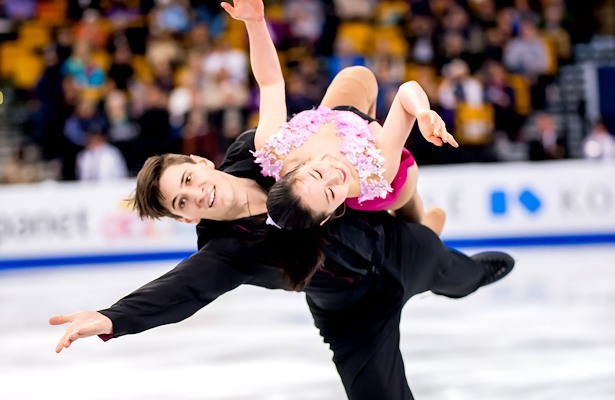 The early result of the off-season training has already shown as the pair performed a triple twist in Dreams on Ice, an ice show held during the first week of July. The next priority is to polish up their skating. “Maybe we also need to improve our speed a bit,” Boudreau-Audet concluded. Both skaters understand that communication is the key to improve connection, and are making efforts to break the language and cultural barrier. “Of course there is a bit of a language barrier,” admitted Boudreau-Audet, who hails from Saint-Jean-sur-Richelieu, Que., “but I am taking a Japanese course, so it helped a bit.” “He really understands Japanese culture, so I don’t find it difficult to communicate with him,” added his partner, who is from Yokohama. In fact, since he turned from singles to pairs in 2013, Boudreau-Audet has been representing Japan in international events. While obtaining Japanese citizenship for Boudreau-Audet will be the largest barrier in order for the cross-country pair to compete at the Olympics, they don’t want to dwell on it too much. In the meantime, the skaters were assigned a Grand Prix event –NHK Trophy– for the upcoming season in Sapporo, Japan, and are hoping they will also get an ISU Challenger event this fall. “We will do it ‘pas à pas’ (‘step by step’ in French),” Boudreau-Audet concluded.